Dominating the skyline of the Dutch city of Oldenzaal is the church tower at its centre, and from where the near-800-year-old town fans out all around towards the countryside beyond. The square tower is the connection between this quiet city and groundbreaking contemporary watchmaking because way up, almost at its peak, is an old chiming clock, which for generations has been maintained for the citizens of Oldenzaal by a local watchmaking family whose name is now one of the most respected and fêted names in modern horology. For two brothers who grew up in the shadows of that tower Bart and Tim Grönefeld had a close affection for the workings of the clock, as it was their granddad Johan followed by their dad Sjef whose charge it was to ensure its elaborate mechanism and the carillion chime kept the townsfolk punctual. Indeed, in 2016 those same two brothers would unveil a globally received technical tour de force whose undisguised inspiration was the tower clock’s remontoir mechanism. As if destiny was some kind of clockwork, Bart left Oldenzaal bound for watchmaking school and eventually graduating to the respected WOSTEP programme in Neuchâtel where a prodigious talent emerged. Now joined by a fully trained and qualified brother Tim, the two secured highly cherished positions of responsibility, including the Renaud et Papi manufacture, where technical innovation and high complications were developed and prototyped for many of Switzerland’s Grandes Maisons. In this environment, the brothers excelled. Appreciative of their own skills and often working side by side with many who would themselves create reputations as the very finest master watchmakers of our time, Tim and Bart’s own passion evolved into ambition, as the brothers realised the time was right for them to strike out on their own. Returning to Oldenzaal and establishing their own workshop above the family shop, the Grönefelds set to work on their first eponymous timepiece, which on its introduction in 2008 was greeted with acclaim. The Grönefeld GTM-06 Tourbillon Minute Repeater was quite simply an incredible and unique achievement, as its design had been centred around optimising the tone and resonance of its long chiming gongs, and of course the seamless integration of its tourbillon too. The level of its execution both technically and in the finishing of every detail was profound. 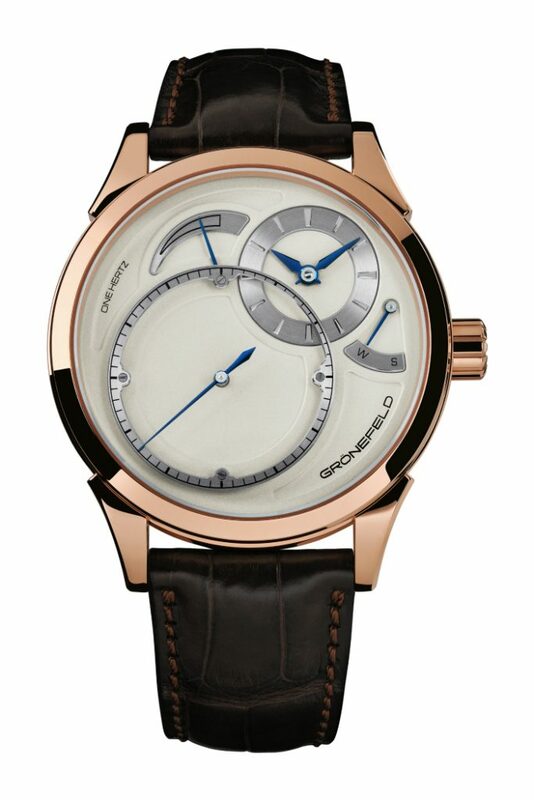 If the GTM-06 had raised curious eyebrows outside of their immediate peer group, who were well aware of the Grönefeld’s talents, as a tiny independent watch company – in Holland of all places – much work had yet to be done to achieve the kind of exposure essential for survival and maybe even growth, but it would come. The arrival in 2010 of their jaw-droppingly beautiful One Hertz would fire a momentum which would thrust the genial siblings right into the spotlight of industry attention. Picking up high profile awards it was a technical and aesthetic tour de force. Reviving a complication which once upon a time represented the pinnacle in watchmaking precision, its jumping seconds is powered and driven by an independent barrel and gear train. Its spaciously appointed dial, dominated by the huge independently driven dead seconds was an instant hit. Like its predecessor the One Hertz was entirely conceived, designed and manufactured in-house; its name deriving from the lazy motion of its big beautiful balance which oscillated at a leisurely 21,600vph, and its immaculate uncluttered design and molecular attention to every detail throughout established what would become a signature Grönefeld identity, and a winning formula. Even in areas where some old school master watchmakers might think it matters less, the same fastidious standards applied throughout, and when turned over the sheer beauty of the movement’s bridges, plates and detail added to the exclusivity associated with the Grönefeld name. Such was the actual physical demand for the One Hertz that its initial production soon sold out, and while that was great news for the immediate future of the young company, in order to satisfy the growing mob of insistent buyers, further editions which experimented with materials, colours and skeletonisation allowed One Hertz to explore its true potential. It remains a key piece in the Grönefeld portfolio. News of a new Grönefeld was by now an eagerly anticipated event, and the Parallax Tourbillon did not disappoint. Retaining many of the styling cues from its predecessor, they performed the rare feat of following up on a classic – with a masterpiece. Taking its name from the phenomenon which is distortion in the visual perspective, the Parallax Tourbillon’s extra-long dial-hugging seconds hand eliminated the illusion of background movement, increasing at-a-glance reading accuracy, but of course, there was much more to see here than the seconds hand. With the hours and minutes once again dispatched to the dial’s outer regions, attention is directed onto a truly magnificent tourbillon, highlighted by its apparent serene isolation set within a steel well. The dial also featured recessed panels for the power reserve display as well as the little pointer which indicated if the crown was in winding or setting position, and yet despite the complexity of achieving this configuration, it still retains a sense of uncluttered spaciousness. A very apparent Grönefeld trait was by now becoming crystal clear; these were no ordinary watches, but then nor are the watchmakers. Few other independents could put into series production timepieces of such consistently exceptional quality and horologic fascination, and the Parallax Tourbillon served to strengthen a reputation which was fast gaining notoriety among the most discerning of collectors around the world. As critics scrambled for superlatives and collectors for their wallets, the industry again paid its dues and the Parallax picked up numerous awards, including at the annual lavish ‘Oscars’ of the watchmaking industry, the 2014 GPHG, where they lifted the hotly contested Best Tourbillon award. 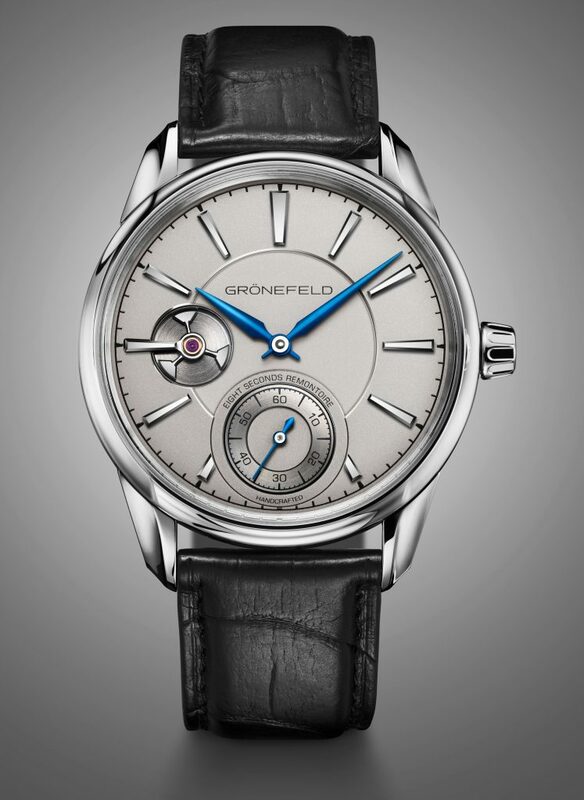 If the world was becoming familiar with the Grönefeld ‘look’, a surprise awaited at the 2016 Baselworld expo where the next chapter, entitled 1941 Remontoire, was presented. Gone were the modernist asymmetric visual similarities of the One Hertz and the Parallax, and in was an entirely new, more conventional three-hand configuration, but with a captivating little curio which springs into life for an instant, every eight seconds. Taking its inspiration from the antique mechanical workings of the church tower clock which their dad and mentor Sjef still services and maintains, the brother’s 1941 Remontoire reinterprets in miniature the old remontoire complication. The purpose of the remontoire is to ensure a non-fluctuating constant force throughout the cycle of energy delivery from the mainspring. Storing this energy and releasing it in a burst at precisely eight-second intervals, its practical benefit equates to enhanced accuracy, but as a visual feature, it is a treat. 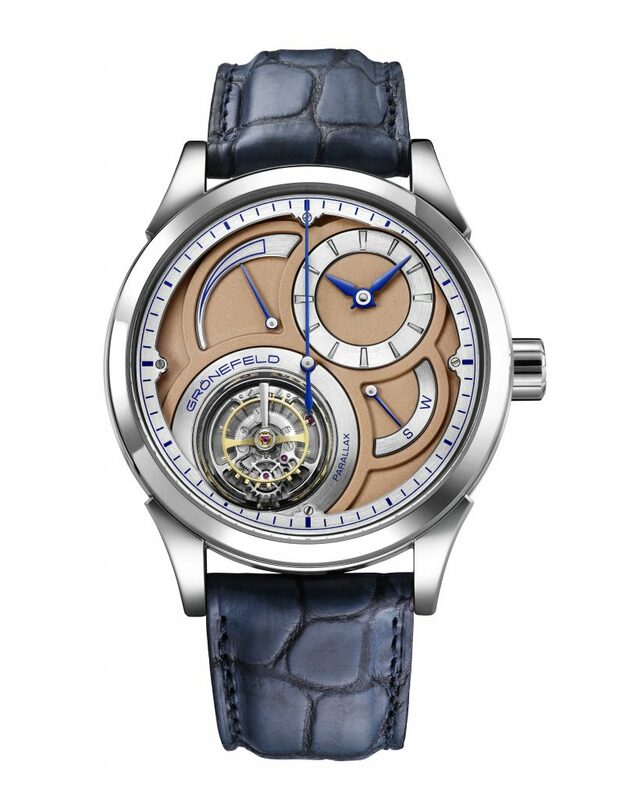 Introducing a new superbly sculpted case, with deep recesses and flowing curved surfaces and featuring a dial of solid Sterling Silver with blued steel hands and small seconds it represents a confident departure from its predecessors, but the 1941 Remontoire is still pure Grönefeld, and the awards season is looming. 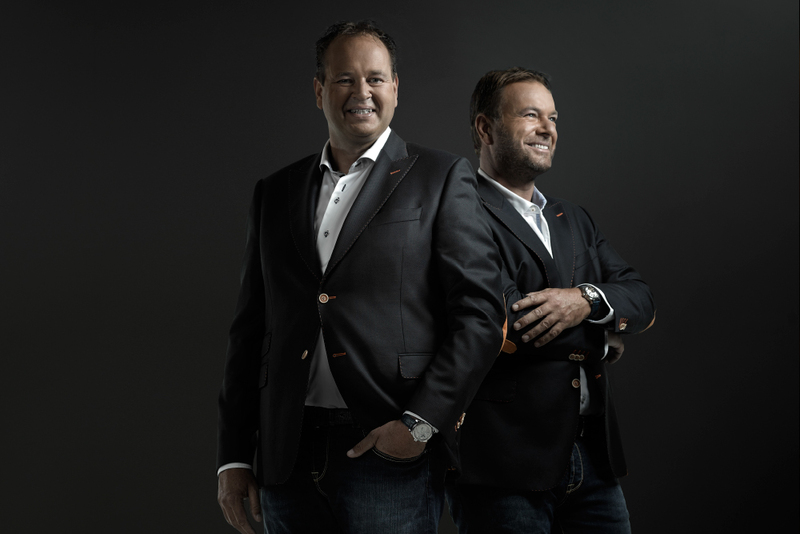 After years of working incognito on complications for famous brands, the Horological Brothers, as Bart and Tim are now affectionately known, have found devoted followers around the world. Their skills and personalities have taken them a long way from those two young lads from a small Dutch city with an old church tower clock, whose chimes punctuated their everyday Oldenzaal lives, and to celebrate their origins and their Grönefeld family heritage with another horological masterpiece, and the respect of the world.